Please note that all the bears seen here wearing the T-shirts belong to our own hug (group of bears) and are not for sale! 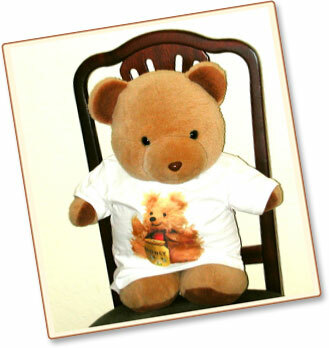 Herbert models a toddler's T-shirt (18 - 24 months) with Honey Bear design approximately 7 Inches square. 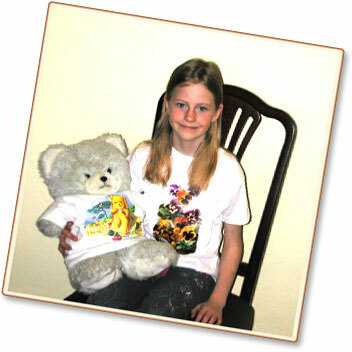 Mrs. Muffin is wearing a baby's T-shirt (size 9 - 12 months) with an A5 size Seaside Bear pattern, and slim Jenny, aged eight, models the A5 in the Bears and Pansies design on the 3 to 4 year old T-shirt. 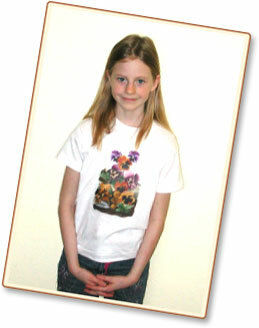 Jenny, aged eight, models the A5 in the Bears and Pansies design on the 3 to 4 year old T-shirt. 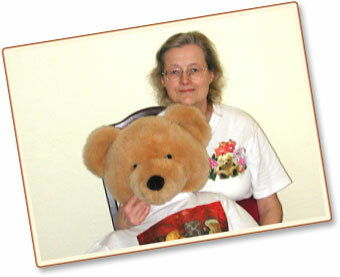 Amanda the bear is wearing with an A4 size pattern, and Tiiu is wearing Orchid Bear in A5 size printed in the top left corner. 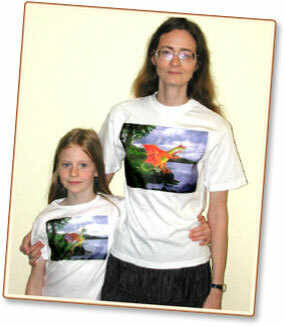 These young ladies are modelling the Red Dragon on a 10 - 11 year old size T-shirt and the Blue Dragon on an approximately five year old size.